Jubilee Square in the centre of Simon’s Town is the heart of this naval town and has been the meeting and market place of locals and visitors since the 1880’s. Visitors to Simon’s Town, whether on their way to the penguin colony at Boulders, or heading down to Cape Point, find this a perfect stop because there is a lot to see and do. The square itself is full of surprises and you could come across a Great Dane parade in honour of Just Nuisance, a display of vintage cars, the Great Little Market under colourful bunting, carols on the square and other local community events and festivals. The statue of Just Nuisance on Jubilee Square, Simon’s Town, is the most photographed and iconic feature of the square. 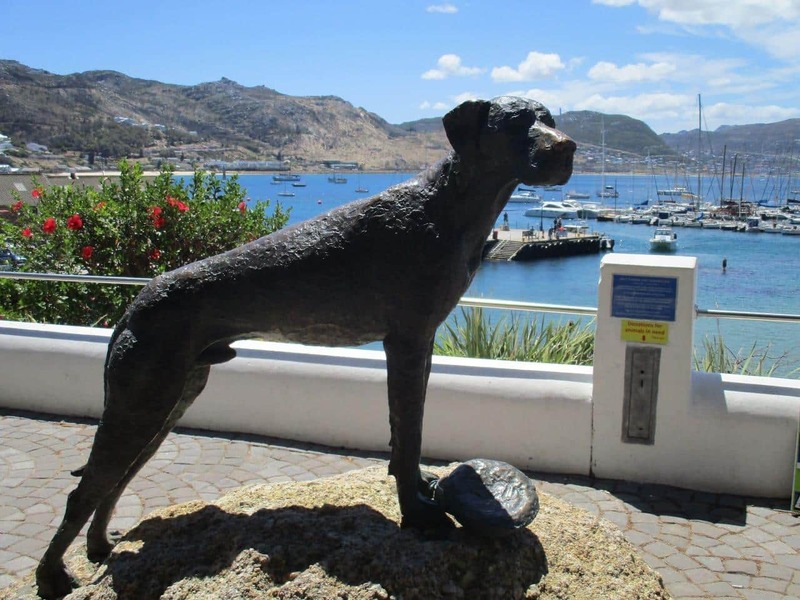 Honouring the Great Dane who was enlisted as Able Seaman in the Royal Navy at the start of the Second World War, the bronze statue of this famous dog stands proudly overlooking the SA naval harbour and the False Bay Yacht Club. Another more sobering reference to SA’s naval history, is the dedication plaque to the sailors of the South African Native Labour Contingent, who died when the SS Mendi sank in 1917 during the First World War. The jetty, in a picture-perfect setting, is a natural extension of the square and well worth a gentle stroll. For those who are not into gentle and want some action, there is the choice of kayaking, adrenaline boat trips, deep sea fishing, whale watching and Cape Point cruises. A section of the Square is dedicated to the display and sale of African curios and craft while the trade in brightly coloured bead- and wirework spills over onto the jetty in front of the popular restaurant, Bertha’s, a perfect spot for a waterside brunch. Shopping at the Quayside Waterfront Centre or just breathing in the fresh sea air, will work up an appetite and the Simon’s Town Square & Jetty offers some great choices like Saveur for fine dining or the Salty Sea Dog—another Simon’s Town icon—for take-away hake and chips. Couple that with a fresh sea breeze and you are in for a fantastic day out. See pics others have shared, and share your own using #lovecapetown.